It was with a bit of a heavy heart that we started our trek north after disembarking from the Spirit of Tasmania. On the one hand, I was really excited about heading closer to home, and the call of a comfortable bed and familiar belongings was pretty strong. But I was also sad at the thought that in a few short weeks this amazing adventure would soon come to an end. Still, we had a few more sights to cross off our list before getting home so we headed out of Melbourne with the excitement of a new and unfamiliar destination around the corner. I wasn’t entirely certain of our first camping spot but a quick scan of WikiCamps as we were driving led us to a lovely farm stay called Tostaree Cottages. They have room for a few campers in a well-maintained, flat, open pasture that essentially feels like you are camping in their backyard. Covering something like 300 acres, the rolling green hills of this property were a lovely change from the rainy, snowy mountains we’d just left in Tasmania. The weather was sunny and glorious, although the air was still a bit crisp, but we didn’t need our annex and set up for a quick overnight stay. There was only one other group of campers there, a young family with similar-aged children who Charlotte quickly made friends with. The children then announced that shortly one of the farm’s owners, Greg, would be coming by in his ATV (all terrain vehicle) to take us all on a tour of the farm if we wanted. What fun! Oh lord – what an adventure that ride was! Charlotte was desperate to stand up in the back with Daddy and one other child while I shared the front seat with Greg and our neighbour’s second child. Greg gave us lots of information about farming cattle and sheep (for meat purposes) and we identified new calves that were only a day or two old. Over hill and down dale we went, bouncing and banging and generally having a scream of a time. Now I know why those things are so bloody dangerous and cause so many injuries on farms! But we escaped unscathed and returned to camp after an hour or so with flushed cheeks and lots of laughs. Can you spot our camp? From Tostaree it was onwards to Burra and across a new state border into NSW. We were heading to a visit with Chris and Peter (Chris is Kerrilee’s brother, my best friend we stayed with in Devonport). Chris and Peter live on acreage about half an hour outside of Canberra (officially in NSW) and we were made to feel very welcome during our stay there. We didn’t need to set up the camper as we were offered their spare bedroom. Chris and Peter both enjoy gaming so Brandon was able to catch up on the World of Warcraft gossip while we were there and I was able to catch up on some reading while Charlotte enjoyed the Nick Jr channel! We were so comfortable, I forgot to take any photos at Chris and Pete’s place, so I asked them to send me something instead 😉 Here is Chris’s selfie! We were counting down the days until we had to be home, so we only had time for a flying visit to Canberra, which included a drive around the outside of Parliament House. Charlotte loves a good Australian flag at the best of times, but even she was bowled over by the majesty of this giant flag pole high atop the hill at Parliament House. Charlotte had to play ‘cool’ and was told to show her ‘guns’ (finger points) but she struggled because the glasses she was given to wear only had one arm and kept falling off! Using air to attempt to push a beach ball through a hoop – very hard! One exhibit allowed you to feel a simulated earth quake. You built a tower and then watched to see if it would withstand the quake! After leaving Burra we drove to Parkes, NSW – home of the The Dish, a radio telescope instrumental in supporting NASA throughout the Apollo program, and still active today. I had driven past this place (officially called the Parkes Observatory) quite a few times but never stopped so I really wanted to get there on this trip. I really enjoyed our visit to the observatory. We watched a few 3D movies which gave us some interesting information on space, the relative size of things in space, and other topics relevant to the telescope. We were able to get quite close to the telescope and watched it move around quite a lot which was exciting. It stands 58m tall, is 64m in diameter and the dish alone weighs 300 tonnes. It can tilt to 60 degrees from the vertical and takes 5 minutes to get to this maximum tilt. For a full 360 degree rotation, the time is 15 minutes. Officially it is only rated to operate in maximum wind speeds of 35 km/h but apparently on the night when the Apollo landing was taking place, the winds peaked to 2-3 times that speed and it managed to cope (albeit with some nervous operators in the control tower). About to head in – is it just me or does Brandon look like he’s balancing on his heels? That night we stayed at Peak Hill just a little north of Parkes. Our plan to was to hit up Taronga Western Plains Zoo (aka Dubbo Zoo) the next day but we had been warned that Dubbo wasn’t that secure so best not to leave the camper unattended. To combat this, we decided to camp at Peak Hill then we’d be only an hour away from Dubbo and would take the car and camper to the zoo. Then we’d go to a Dubbo caravan park that afternoon after finishing up at the zoo. We happened across a lovely little caravan park in Peak Hill called the Double D Caravan Park where every morning they put on a free pancake breakfast and the windscreen cleaning fairy comes to clean your windscreen! It was fantastic. It was also the only caravan park we’d stayed at that had a lovely looking (new) vegetable garden. Charlotte was attracted to the ponies and birds, of course 😉 We had a camp site immediately next to the toilets but it wasn’t a busy park and the visitors were mostly older so it was very quiet and we had a nice peaceful night. From here it was on to Dubbo and the zoo. I will do a separate entry for that as there are quite a lot of photos from the zoo, including a very special memory that I will treasure for the rest of my life! Weeks on the road to this point: 14 weeks, 6 days. I have clearly been out of Tasmania for too long – I somewhat naively assumed we’d have good camping weather when we were down there. Wrong! It’s spring – of course I should have remembered it is still cold and wet at this time of the year in Tasmania! My best friend, Kerrilee, lives in Devonport with her 10 year old son, William. I was super excited to drive off the boat (at 6.45am!) and go straight to Kerrilee’s house for breakfast and a catch up 🙂 We had plans to do some camping with Kerrilee and William later in our trip so after stocking up on some groceries and doing some laundry, we reluctantly left the comfort and warmth of Kerrilee’s house and made for our first Tasmanian destination. We had originally planned to head to Arthur River on the north-west coast for a night and then Strahan for another two nights. But it was raining all down the coast and we were going to need to set up the full annex in order to stay warm. Therefore we decided to head straight to Strahan and set up there for 3 nights, which would make setting up the full annex a little less bothersome. Strahan is a quaint town on the mid-west coast of Tasmania. I remember camping there a bit as a kid with my parents so I was keen to show my own family one of my childhood places of interest. Now that I think of it, it pretty much rained the entire time we camped there when I was young as well. Not sure how I could have forgotten that! The town sits on the edge of Macquarie Harbour and is famous for two central things – huon pine and convict prisoners. Sarah Island, in Macquarie Harbour, was a convict prison that pre-dated Port Arthur and plays a rich, albeit brutal, piece in Tasmania’s convict history. The forests around Strahan, along the Gordon and Franklin Rivers, are the only place in the world that huon pine grows so abundantly. We did a wonderful boat tour of Macquarie Harbour, Sarah Island, and part of the Gordon River heritage area where we learnt all about these fabulous places and the history of the ‘piners’ who worked deep in the forest to bring the massive huon pine logs back to Strahan for the sawmill. On board the boat we also watched a documentary called The Oldest Living Tasmanian, about the piners and the huon pine industry in Tasmania. It was a fabulous insight into the history of this area and I would recommend watching it if you ever get the chance. As anticipated, it rained and rained and rained while we were in Strahan. It was also incredibly windy and on our last night there we encountered 92 km/h winds! Our annex stood through it all (we’d learnt our lesson after Echuca, and we had all the walls attached and the floor down which contributed to the stability). On the morning we packed up we had a brief break from the rain long enough to pack up without our stuff getting wet but the floor and walls all had to be put away quite wet which isn’t ideal. I’m writing this some two weeks later and they are still folded up in the camper and probably won’t get an airing now until we get home! The first peek at snow – little did we know, more was to come! We pushed on to Hobart where we had been offered a place to stay with a primary school friend of mine, Andrea, and her family. The promise of a warm building to sleep in rather than a camper was pretty enticing. The main purpose of visiting Hobart was to spend time with my beloved cousin, Anica, and her partner, Phillippa, the closest thing Charlotte has to ‘aunts’ and very important people to us (not forgetting her real great-aunts, of course!). So we spent as much time as we could with them while in Hobart and didn’t do a huge amount of site-seeing. We’ve been to Hobart quite a few times before so this visit was all about family. That being said, we did go to MONA (Museum of Old and New Art) because Brandon hadn’t been there yet; Brandon and I also did a Cascade Brewery tour while Pip babysat Charlotte for us. Brandon spent a lot of time building Lego – our host family are avid members of the Tasmanian ‘brick’ enthusiasts scene and had a ‘brixhibition’ coming up the following weekend. Brandon was more than happy to help out by building one of the displays that Andrea planned to exhibit that weekend. Brandon takes Anica’s scooter a spin! Andrea’s ferret was also a big hit with Charlotte. I’m not convinced – a little too much like a rodent for my liking and I suspect Dobby would probably dispense of it pretty quickly. Still, she was good for some laughs. Leaving Hobart our plan was originally to then travel to the east coast of Tasmania and spend 3 nights camping at the Bay of Fires with Kerrilee and William, then head to Devonport and spend 3 nights at Kerrilee’s house before boarding the boat back to the mainland. Kerrilee and I had already agreed that if the forecast was for rain, we’d just head straight to Devonport and stay with her for 6 nights and do day trips from her place. I shouldn’t have been surprised that this was what happened! We had a lovely extended stay in a warm, dry house (I’d almost forgotten how to set up the camper by now!) and we visited a number of the local attractions that we hadn’t seen on any of our previous trips to Tasmania. First up was a day trip to ‘the nut’, a landmark in Stanley on the western end of the north coast of Tasmania. When I was first there as a kid, you had to walk up and down the nut if you wanted to check out the view. These days they have a chairlift which made the trip far more pleasant for these old bones! Chairlifts make it so much easier! Another trip involved a visit to the Mole Creek Caves. This was a great chance to see a wet cave up close and to see the glow worms they have in the cave. Once privately owner, this cave system is now managed by the National Parks and Wildlife Service in Tasmania and it was a great day out. Unlike Tunnel Creek in WA, we didn’t need head lights or anything here – the caves are all lit electrically. You have to go through the cave with a guide and he turns on and off the lights as you reach various stages of the walking track. It’s very well done and quite enjoyable. It also remains a steady 9 degrees inside the cave all year round, so I was a bit chilled and actually felt warm as we came to the surface again! It was lovely to spend some time chilling with Kerrilee and William and not having the stresses and strains of camper life. But all good things come to an end and pretty soon it was time to board the boat again and head back to the mainland. Weeks/nights on the road to this point: 14 weeks, 1 day. Our luck with weather was about to change. Until arriving in Victoria the worst weather we had experienced was cold nights and wind. We had that one experience with rain at Nanga Bay but other than that, the cold wind was all that had troubled us. I should have known that travelling closer to Victoria and Tasmania would see the weather gods turn against us. Just before crossing the border into Victoria we drove through the Hallett Wind Farm area. Producing enough power to supply 200,000 households, the 167 giant wind turbines that make up the Hallett Wind Farm are truly a spectacular sight – I hadn’t seen anything like it before. Spread out over a series of hills in the area around the town of Hallett, I was struck by the beauty of the wind farm. We couldn’t get close enough to hear them turning but they appeared as majestic tributes to modern energy production. It was an interesting juxtaposition to see all the stone ruins in the area around the wind farm. This area was once a large rail area with the town of Peterborough being the hub of stream trains transporting goods from Port Pirie to Broken Hill. Apparently 100 or more trains would pass through Peterborough each day and the surrounding area was built up to support the rail workers. They lived in stone buildings and the ruins of all these buildings now litter the surrounding fields. Seeing these ruins in front of the giant wind turbines was quite a sight. Our campsite in Mildura was full of wildlife and interesting sights. Rabbits wandered the grass at night, there were fairy lights in most of the trees and the odd tree carving as well. We even had a very friendly possum visit our site – clearly he/she was used to being fed by the campers because he came right up to us and essentially demanded we feed him! From here we travelled to Echuca, staying in the near-new Moama Waters caravan park. This park was similar in quality to the Streaky Bay caravan park given how new it was but the difference was we had an ensuite site. I haven’t seen one of these before so it was a bit of a novelty. The site was essentially a drive-through site where you park/set up next to a building that houses a toilet, vanity and shower just for your use only, accessed with a key. We used this as a space to lock our bags etc in when we went off exploring and it was great to have this little luxury right next to our camp site. The fauna visitors this time were in the shape of two ducks that just wandered through the camp site helping themselves to whatever they could find! We had to shoo them away because they seemed to take a liking to the ant powder we’d put down around the bottom of the annex poles. The site also came with a fair deal of wind and unfortunately we came back to camp one day to find our annex had been blown down. Our neighbours had thoughtfully tied it off so that no further damage would be done but we snapped the new make-shift ridge pole that Brandon had put together back in the first weeks of our trip (after we left the original one at Bramwell Station). Thankfully we had spares of these poles so a new one was soon created 😉 But that was our first taste of the wind that would soon mar a number of future camp sites. The main activity we planned for Echuca was a Murray River paddle steamer cruise. I remember doing one of these as a kid and I really wanted Charlotte and Brandon to enjoy the paddle steamer like I had once done. We went on the PS Emmylou and enjoyed a nice lunch on board as we cruised up and down the Murray River. At one point we went past the giant pile of wood they have cut up for the Emmylou which impressed Charlotte. She was able to see the engine working as we chugged up the river but I was disappointed to see that the paddle itself was housed behind a series of wooden slats so Charlotte wasn’t able to see that in action. There was a small window looking in to the paddle wheel but it was a little hard to see. Engine room – fuelled by steam, there was a giant wood fire down below this. Hmmm what’s wrong with this picture? I think there’s supposed to be a wheel in there somewhere? When we arrived in Ballarat it was raining, cold and windy. I had decided we would try to get a cabin at the caravan park because we were only here for 2 nights and I didn’t want to pack up a wet camper to then get on the boat with. We’d also be warmer and more comfortable. Thankfully the local Big 4 had a cabin free for us to use, although we still had to use the caravan park amenities. It was a small, quiet caravan park and within walking distance to Sovereign Hill, so this only caveat wasn’t too problematic. It also helped that our cabin was directly across the road from the toilet block 😉 Once we were settled in, I looked out our window from the warm, dry cabin at the others in camper trailers who were setting up in the rain and felt rather satisfied with our decision! Our main purpose for going to Ballarat was to see Sovereign Hill, another memory I have from my younger days travelling in this area. Sovereign Hill is like a living museum and piece of the Australian goldmining history. Gold was discovered in Ballarat in 1851 and within 10 years the city had grown to be an established town. You walk the streets of Sovereign Hill and soak up the history, the shops are all set up like the shops would have been in the mid 19th century. There’s a blacksmith, a wheel-maker, bakery, and metalsmith. There’s a confectioner, horse and carriage rides and you can even pan for gold in a stream of water that was what the original goldminers used back in the day. All the attractions are staffed by people in period costume who show you how people did those particular trades back in the day. There is also a tour of one of the underground gold mines where you enter and exit on a genuine mine tram that takes you down into the very dark mine. There’s also a ‘gold pour’ where molten gold is poured into a mould to make a $160,000 gold bar. As part of that demonstration and the mine tour we learnt about how the gold was separated from the quartz rock that it came from. The whole day was just fascinating and other than some tired legs by the end of the day, we all had a great time. That being said, it was a nice treat to come home to a warm cabin at the end of the grey and dreary day. All that panning for this? The Spirit of Tasmania here we come! … and on to the boat! Weeks/nights on the road to this point: 12 weeks. Forgive me as it has been some weeks since my last blog post. For anyone contemplating a trip like this, I definitely suggest you make sure you have lots and lots of time. It really is an exhausting endeavour to travel around the entirety of Australia in just under 4 months. We started the trip with naive optimism and allowed ourselves to spend extra nights here and there. While this flexibility made for a more relaxed first half to our trip, it has undoubtedly contributed to us feeling a little more rushed for the second half. At the end of my last post we were about to head off across the Nullarbor. I was super excited about this prospect for a number of reasons. Probably the strongest of these was that crossing the Nullarbor meant heading closer to the things I was more familiar with – towns I’d been to before and even landscapes I was used to seeing. We wouldn’t seem so far away from it all, we’d be back into a similar time zone. Another reason for looking forward to crossing the Nullarbor was that I really wanted to see the Nullarbor! I’d heard so much about this epic stretch of Australia and it once seemed so formidable. I was excited to be able to see if for myself. So when last I wrote we were staying the night in a hotel room in Esperance to escape the cold (oh boy – if only I knew then what awaited us when we arrived in Tasmania! )… Because we didn’t need to pack up the camp site in the morning, we made use of having a little extra time and visited a local wildflower show. We missed the ‘big’ one in Ravensthorpe on our way to Esperance so it was nice to read a flyer advertising a smaller display at the local church. After this it was on towards the Nullarbor and the longest, straightest stretch of road in Australia (146km). I actually ended up driving a lot of that to give Brandon a break from driving. I figure what harm could I do driving in a straight line?! The biggest inhabitants of this neck off the woods are suicidal bugs! The scenery of the Nullarbor was rather bland but we expected that. However, we pulled over at one of the many lookout spots along the way and were rewarded with a great view of the coastline – that was what I really wanted to see. The Great Australian Bight – it was awe-inspiring. Before long we had crossed the border into South Australia and immediately lost 1 and ½ hours! Crossing into a new time zone can sometimes be difficult – one minute it is 4pm and the next it is 5.30pm. I know it probably doesn’t seem like a big deal but when you are driving from one destination to the next and you are making plans to stop at a certain place and set up camp for the night, you tend to watch the clock a bit in the late afternoon so as to avoid having to set up camp in the dark. Crossing the border into SA we suddenly lost some time. Thankfully we were staying at the Nullarbor Roadhouse that night which makes set up a little easier (dinners usually take place in the roadhouse restaurant on nights like this). 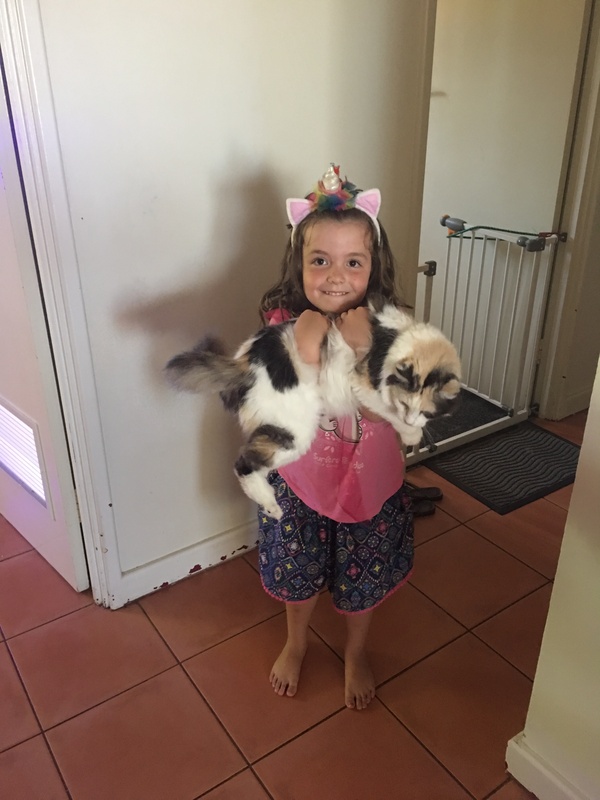 Charlotte actually made a friend at the roadhouse – the 6 year old son of a fellow camper trailer travelling family, The Howards, who we had actually seen at the lookout earlier that day. We shared a dinner table and discovered some remarkable similarities between the Howards and ourselves. It was a lovely connection and when they said they were heading to Streaky Bay the next day we decided to modify our plans and head there too (we had originally planned to Venus Bay for a few nights but we had no reason to be there specifically, so stopping a short distance away from that in Streaky Bay was not difficult). Charlotte and Ashley – we haven’t seen a camel yet! On the way along the second half of the Nullarbor the next day we stopped at the Head of the Bight, which is the best place to see whales during the spring season. We weren’t disappointed – there were at least 5 pairs of mothers and calves frolicking in the water beneath the cliffs and it was delightful to watch. Our (my?) reason for selecting Streaky Bay wasn’t just to give Charlotte a play friend for a few days; Jo showed us photos of the bathrooms which were all set up like ensuites – each has a toilet, vanity and large shower. The Streaky Bay Islands Caravan Park has only been open since February of this year and it was such a luxurious treat to find such great amenities! The park has large (very large), tiered camp sites that are perfectly flat. The attraction of a clean amenities block! It was a great place to stay for a few days. It was also a bit cold and windy but we weren’t allowed to use our OzPig stove. This was a great opportunity to head into town and look for a Mr Heater Buddy portable heater. We had wanted an alternative heat source for times like this and had been researching camping heaters so we were pleased to find the local hardware store had what we wanted. We won’t use it in the camper itself (despite what you see in this photo – that was a test), it will be for the annex. 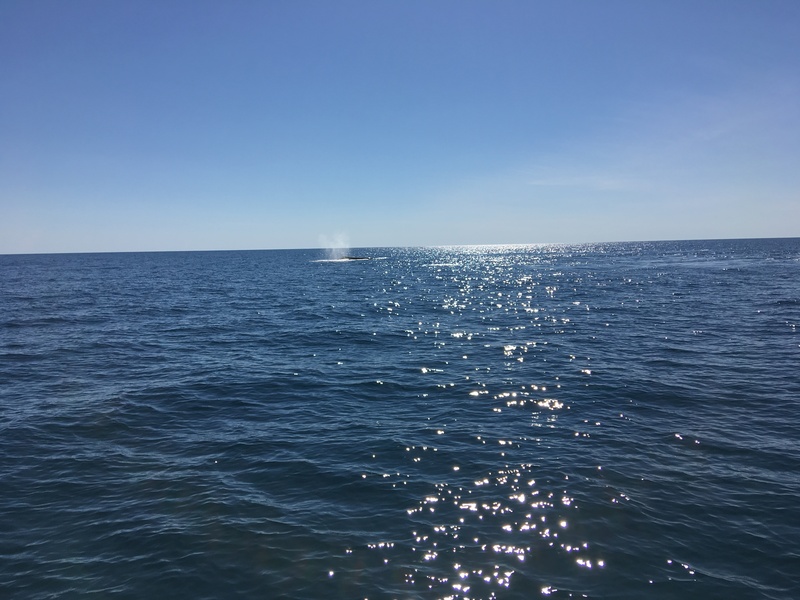 Streaky Bay has a few sights to see, one of which was a series of blowholes which we took a trip to see. Charlotte loved the long boardwalks that allowed her to run ahead of us. I just love the cliffs and coastline here – it’s breathtaking. And cold! The wind that comes up here pretty much comes straight from the South Pole, I’m sure! 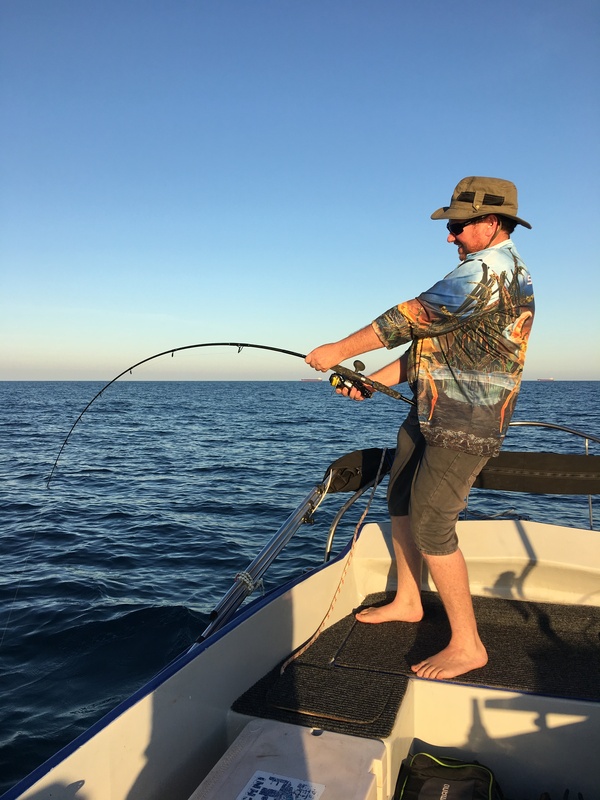 After two nights in Streaky Bay, it was time to continue the trek east – we had a date with a big ship that was going to take us across the Bass Strait! So we headed further along the Eyre Highway towards Victoria, a route that took us through Kimba, South Australia. I had heard about the painted silos that seem to be dotted across the country, mostly in South Australia and Victoria. So I was really pleased to see that Kimba had some painted silos! They were every bit as impressive as I had hoped they would be. We weren’t exactly sure where we were going to end up when we left Streaky Bay because we didn’t know exactly how far we were going to be able to travel that day (recall what I said earlier about changing time zones!). We had thought we’d stop at Port Augusta but nothing there really took our fancy and we still had a little bit of daylight left so we kept moving. We headed a little further east towards Wilmington but we couldn’t find a 24 hour rest stop which was the first time we’d had that problem. It seems the southern states may not have as many of them as we’d encountered in WA. So we were starting to get a little nervous when it was getting to be dusk and we hadn’t yet spotted anywhere yet to stay. WikiCamps hadn’t provided any morsels of joy either. If we were travelling in a caravan we’d probably be able to just pull over on the side of the road somewhere and set up camp. You have more security in a caravan and don’t feel quite as open to the elements. 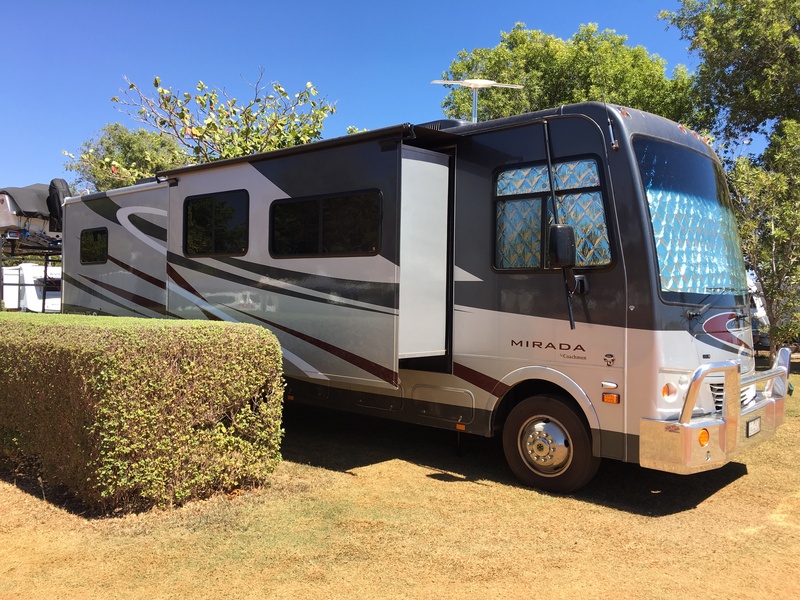 But in a camper trailer, where all your cooking and living still happen outside and when you only have canvas between you and what waits outside, it’s a little less secure. In order to stay warm (well, not freeze), we also have to make sure all our canvas was zipped up tight which means no windows to look out. You’re a little like a sitting duck if someone wanted to come along and cause trouble. So we try to avoid just pulling up on the side of the road, particularly in towns, unless we’re in a gazetted rest area. The next day we headed off with the excitement of knowing that we were going to reach Victoria today. At least, I was excited. As we have been getting further and further east I have noticed Brandon getting a little less excited about places, perhaps not quite as enthusiastic as I have been about our impending Victorian/Tasmanian travels. I suspect that’s more a sign of him missing all that is now behind us and feeling rushed more than not necessarily wanting to go east. The downside to doing a trip this quick is that a lot of places you really like or want to explore you can’t really spend a lot of time at. It’s more an opportunity to identify parts of the country you want to come back and visit again. I know Brandon has already started planning a southern WA trip to see the wildflowers in more detail, hopefully this time with his Dad. I was excited to be heading towards a part of the country I felt more familiar with, scenery that made me feel ‘at home’ and seemed less foreign. I have gotten so much out of what we’ve seen so far and am thrilled we had the chance to spend so much time in WA, but I was also constantly aware of how different the countryside over there was and how far way we were from everything. We were now going to be visiting places I’d been to before but wanted to share with Brandon and Charlotte – it felt nice to be heading towards a part of the country that was closer to home, that looked and felt more predictable. Leaving Port Hedland (past the giant salt mountain! ), we travelled south towards Monkey Mia. We weren’t actually planning to stay at Monkey Mia as we had been told it was over-rated and too expensive, so we used WikiCamps to select another place on the road into Monkey Mia, a placed called Nanga Bay Resort. While quite comfortable, it’s fair to say that Nanga Bay did not meet my expectations of a place with ‘resort’ in the title. Perhaps it’s the Queenslander in me expecting something like the Marina Mirage Resort, or Twin Waters Resort, but seriously, there’s nothing much resort-ish about Nanga Bay by comparison. I didn’t expect to stay in a resort per se, but when you are travelling to a place that calls itself a resort, you get rather excited about what you might find there. Anyway, what we did find as we came around the corner was some rather lovely blue water and clear blue skies. Our hosts at Nanga Bay were very welcoming and invited us to join their communal fire that evening so we chatted to the other guests and generally had a relaxing time. 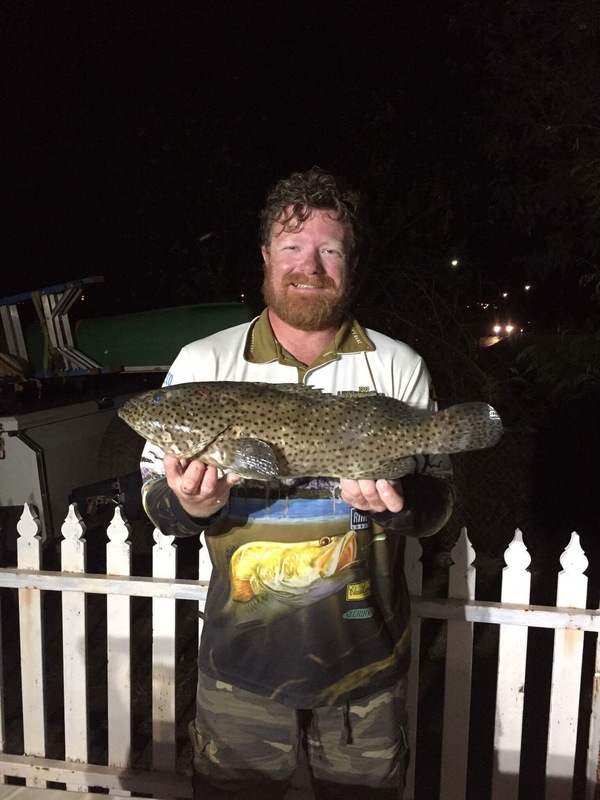 Brandon was invited to go fishing in the morning with another guest so we went to bed feeling rather pleased with our choice of accommodation. As we were staying for only 2 nights we didn’t put the annex up as we decided to use the car annex and avoid the extra hassle of the big camper annex. In hindsight, that was probably a mistake. We awoke to a fairly drizzly, grey day. It was the first rain we had seen since the drizzle at Seisia on the tip of Cape York so it was a little strange for us to feel this sensation on our skin! Brandon passed on the fishing trip and we made our way in to Denham and Monkey Mia but we were too late to see the dolphins. We had been warned by our camp host that there probably wouldn’t be many there and that Monkey Mia was closing for 6 months at the end of this season to “retrain the dolphins”. When we got there we were told that they had 3 dolphins turn up; past visitors had told us they didn’t let you into the water or very near the dolphins when they were there so all in all, we were kind of pleased we didn’t spend any money on what would have been a rather lack-lustre experience. Charlotte enjoyed the gift shop as much as she would have done seeing the dolphins and we came away with a new dolphin toy to add to her growing souvenir collection! By the time we got back to our camp, the place was saturated and the rain looked to have settled in. There was also a gale force wind knocking us around and it was really rather miserable, given we didn’t have our annex set up. The only dry spaces we had were in the car or in the camper but all of our food, cooking and fridge requirements were outside the camper. The toilet block was quite some distance away so we really couldn’t do anything without getting saturated. I had no way of cooking and the camp kitchen at the resort was lacking in facilities, so we had no choice but to dine at the on-site restaurant. I should point out that it wasn’t really a restaurant as such, more like you select a meal from their small list and tell them when you’d like to eat and they have it ready for you to eat in their dining room. I told the host I was really craving vegetables as we’d had a series of fried meals lately (e.g. fish and chips, schnitzel and chips) and my body needed something real. She told me that they didn’t have any vegetables as the truck hadn’t come yet, so I selected chicken wings and rice from the menu and said it was the rice I really wanted more than anything. I made a joke about bringing some of our vegetables then the host says if you drop some vegetables to me, I’ll make you a nice fried rice. That certainly sounded great! By the time I left, she had offered to upgrade that to stir fry beef and rice – winner! Charlotte was having nuggets and chips with a taste of my fried rice, and Brandon order a parmy (his craving for vegetables is never as strong as mine!). I dropped a mixture of frozen and fresh vegetables around later on my way to the shower block (all of which involved getting well and truly saturated because I pretty much forgot that I have a rain jacket in the car!!). I was excited about getting something nice for dinner and really pleased at how generous our host was being. We rock up for dinner, looking a little like drowned rats, and eagerly await what was to come. The host comes out and says “I think you’ll like what I’ve cooked for you. Do you like chick peas?” Ummm, yes?? I was a bit confused because I wasn’t sure where chick peas fitted in to stir fry beef and rice. Oh boy. Was I in for a gastronomic… nightmare!! I so wish I had taken a photo of what was dished up to me because it was truly horrific. So when the host put the dish in front of me she told me she had made some bush tucker and that I was eating something that had lots of traditional food in it. She said it had “conkleberry nuts” and “something that’s like a yam” in it. Do you know what I saw? I saw a bowl of elbow macaroni, topped with a bean-filled sauce that looked and smelled a lot like baked beans (conkleberry nuts), mixed with giant slices of cucumber (yam), with slices of capsicum, a few slices of beef in a sort of sweet and sour sauce. Ahhhh, really?? What ship do you think I just sailed in on, lady? Brandon says he lost all respect for our host at this point because up until now she had been so welcoming and generous. Thank god she only charged me about $6 for that meal because it was truly horrendous and I cannot believe she thought she was going to convince me that this was something other than some crap she’d pulled together at the last minute. I mean – where was the rice? And my supplied vegetables? When they stepped out of the room, I actually snuck into their kitchen and raided their freezer and retrieved my completely untouched bag of vegetables that was sitting right next to their own giant bag of frozen vegetables!!! We retreated to our camper trailer in the wind and rain and proceeded to have the most uncomfortable (and for me, terrifying) night we have ever had in the camper. The wind was whipping us left and right, the rain was making everything miserable and damp and not much sleep was had that night. We awoke the next morning to a dry, quiet morning. Our canvas had already started to dry and within an hour or so of waking, everything was dry enough for us to start packing up. It was like a totally different vista and our mood lifted as we started to prepare to leave for our next destination. What an odd visit! I was pleased to be moving on. 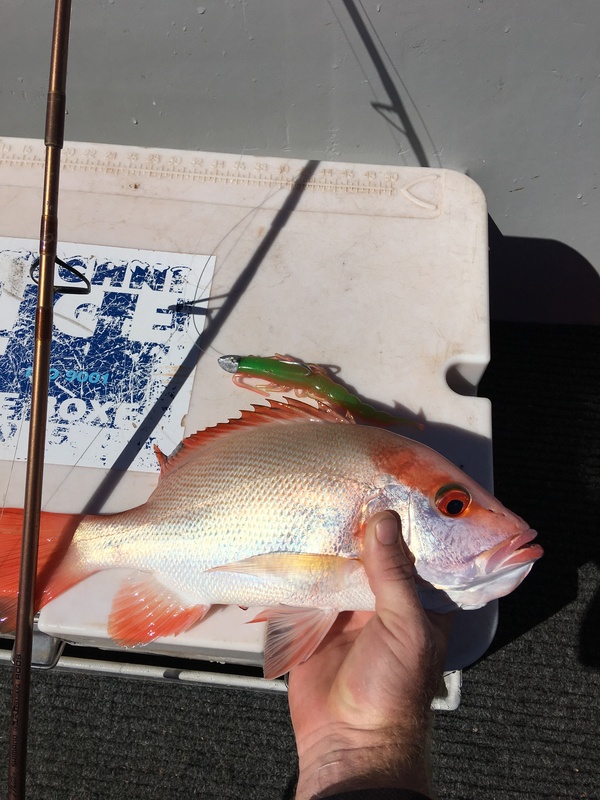 We were travelling to Cervantes next to see the famous Pinnacles National Park, and after the mixed experience we had at Nanga Bay, I wasn’t really sure what to expect of Cervantes. But as we headed further south, I began to relax and by the time we hit Geraldton, I was really starting to enjoy the passing countryside. The rain had well and truly gone by now, and on either side of the road was… green, rolling fields! That’s right – we were now starting to see farmlands. Pastures, flowers, green hills – it was spectacular! For the first time in, well, months I was seeing a richness to the land and I didn’t realise how much I missed it until that point. I was pleasantly surprised by Cervantes, or more accurately by the caravan park we stayed in. After our Nanga Bay disaster, we elected to set up the annex just in case (it wasn’t needed), our camp site came with a large annex mat already on the ground, we were close to the toilets and had a lovely green site. We spent 3 nights there drying out and cleaning up, and it was lovely. Brandon went off for a drive and saw some wildflowers which was excellent, and we went to see the Pinnacles. The Pinnacles are marketed as ‘living fossils’. I’m not sure how fossil-like they are and there are some mixed stories about how they come into being, but essentially they look a lot like rock pillars growing in a desert. You can walk or drive right through the area (we were quite surprised that you are allowed to drive through) but they were certainly an odd and interesting site. The attached gallery/gift shop was also really good and we would definitely recommend you visit there if you’re in the area. It’s only a few kilometres off the main road and, if you choose to drive through, you really only need to spend 20 minutes there. Definitely worth the effort. From the big smoke, we headed south east towards the Stirling Range National Park. We camped for 3 nights at a lovely place called Mt Trio Bush Camp. Situated right on the edge of the Stirling Range National Park, this bush camp is owned by the neighbouring farming family and is in excellent condition. Powered and unpowered sites are available with ample drinking water, and the amenities blocks are in a great condition. For a bush camp, it was an unexpected surprise. A member of the Mt Trio Bush Camp staff visits around 5.30pm each night and lights a communal fire near the camp kitchen. Unfortunately we weren’t allowed to use our OzPig here which was a disappointment because away from the communal fire it was BLOODY COLD! Apparently the temperatures went below zero during the night and I have to say, we felt that. Our new sleeping bags certainly helped a lot, but I fretted that if Charlotte accidentally stuck an arm out of her bag that she’d get hypothermia. It was freeze-your-nose-off-if-it’s-not-in-the-sleeping-bag kind of weather and despite putting our full annex up and being as protected as we could, without our OzPig, we were really feeling the cold. But the trade off was that Brandon got to see some amazing examples of wildflowers, notably orchids. We went for a drive/walk one day to Bluff Knoll, one of the local mountains in the area. We didn’t do the whole walk as it was a bit beyond what we had prepared for, but it was lovely all the same (just don’t go to the Bluff Knoll Café on a Wednesday expecting to have a nice lunch there because it turns out it’s closed on Wednesdays and an out of the way placed called the Amelup Roadhouse is the only place you’ll be able to find a bite to eat on a Wednesday). The Amelup roadhouse has a field of kangaroos next door! I craved pizza but without being allowed to use our wood stove, I had to do a stove-top pan version. Turned out quite good! Brandon browned the top of the pizza with his flame thrower 😉 I’m sure I’ve seen these used on Masterchef? Today we left the cold of the Stirling Range and headed further east. We actually decided to give the cold a break and lashed out for a spot of luxury, staying in the Esperance Best Western! You know you’ve been camping for a long time when a Best Western is considered luxury. But it’s nice to be in from the cold. Esperance seems like a nice place and we plan to use the extra time in the morning tomorrow to do some exploring before we head further east. Unfortunately because we were moving at a fair pace today we had to drive straight past a wildflower show that was on in Ravensthorpe, and I know that really bothered Brandon. So I think he has already started making plans to come back here next spring! We start our trek across the Nullarbor tomorrow (well, we start moving in that direction). We have a few one-night only stops over the next few nights until we reach South Australia and hopefully some milder weather. That being said, I am keeping our -10 degree rated sleeping bags on the bed and I just need to work out a way to stop my nose from freezing! Since leaving home we have come across a number of people who have helped us along the way and it has left such an impression on me I wanted to write a post about it. On our very first day on the road, my Mum said she wanted to buy us some Clearview towing mirrors to help with on-road safety. Unfortunately these are $650 mirrors that you can’t just pick up at your local Super Cheap – we needed to order them in. When you’ve just started an around-Australia trip in the time period we are doing, you don’t plan on being anywhere long enough to wait around for something like that to get ordered in from Melbourne. So we knew we had to find a future destination big enough to have a shop that could order in our mirrors and hold them until we got there. By the time I realised this we were half way to Cape York. Looking at our itinerary the best place that might be was Katherine. So I rang one of the listed suppliers in Katherine, Auto Pro, and spoke to their manager. I explained our situation and said we’d be passing through at some point in the next 10 days to 2 weeks. Not only was Auto Pro willing to order the mirrors for me, they didn’t want a deposit or anything and were happy with a gentlemen’s (woman’s?) agreement that we’d be there soon to get them. Due to the nature of our travel, we had only intermittent phone reception so it was going to be hard to stay in touch with Auto Pro to know the wheels were turning in the background. But sure enough when we were a day away from Katherine we rang and our mirrors had arrived and they were waiting for us in Katherine. Thanks Auto Pro (and Mum)! My next shout out is to Ken, the manager at Bramwell Station. You may recall from an earlier post that we left our ridge pole, complete with LED light rack, in the rafters of a hut at Bramwell Station. After a panicked phone call, the pole was located and taken to the manager, Ken’s, office. Ken is from Brisbane and will be returning there at the end of the season and he has agreed to bring our pole back with him in October. He has our number and he’ll call us when he gets back with our pole. Thanks Ken! After our jockey wheel gave up on us, we needed to make some calls to locate a new one. A few people came to our rescue then. I messaged Amanda with the details and she drove over to talk to Tony at Pilbara Boats and Bikes. While she was there she called us and put Tony on the phone who said he could order our wheel for us but needed to check how long it would take. Within 10 minutes he’d called back to say 48 hours. Sweet! Once again, no deposit or other confirmation needed, just pay the $285 on collection! Thanks Amanda and Tony! Finally (to date), a shout out to West Coast 4WD Centre and the Pilbara Motor Group (PMG). Looking at our upcoming itinerary and the predicted weather, we knew we were going to need to get some warmer bedding for southern WA and beyond. After an internet search, we settled on a particular sleeping bag product called an OzTent Rivergum XL. There are various reasons why we wanted these specific bags which I won’t bore you with here, but needless to say we spent a few hours on the phone trying to track a pair down in much the same manner as our towing mirror arrangement. We could have some delivered to us from the east but it would take 7-10 days, time we didn’t have to wait around. So we needed to find someone nearby who had a pair in stock. Eventually I came across a listed OzTent supplier, West Coast 4WD Centre in north Perth, specifically a guy called Jason. He didn’t have any but he spent 24 hours calling his OzTent supplier and other stores in WA and finally located a pair of sleeping bags for me at the ARB supplies wing of the Pilbara Motor Group in Karratha (ironically where we were just 24 hours earlier!). 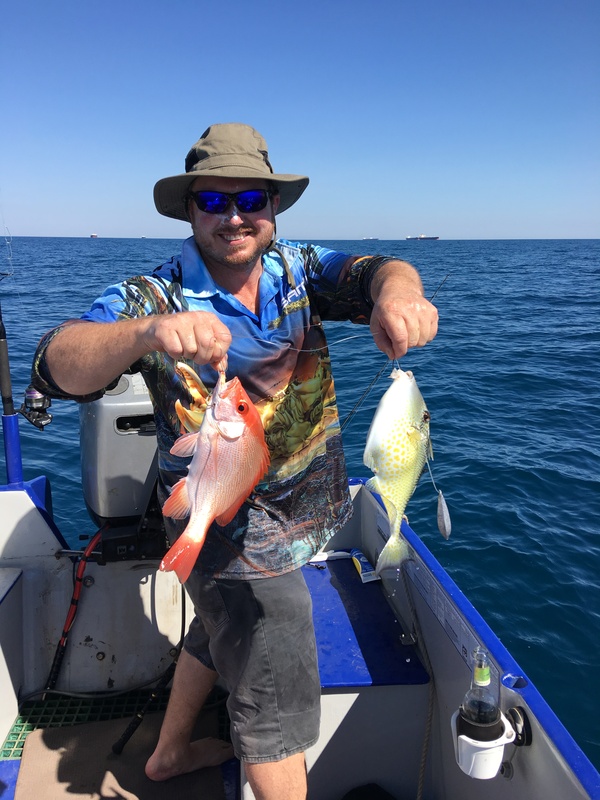 Jason said I could order the bags from PMG and send them to him in Perth – he was missing out on the sale but was still doing all he could to help us! So I got on the phone and the lovely Rhys from PMG took my details and payment information and sent two sleeping bags down to some guy called Jason in Perth. Rhys knew the 4WD Centre in question and said he’d just look up the address on Google for me 😉 Now the issue we faced was that the West Coast 4WD Centre wasn’t open on Sundays and guess what day we were due to pass through Perth? Yep, Sunday. To his credit, Jason actually offered to take the bags home with him and let us collect them from him on Sunday but he had already gone above and beyond for us so I didn’t want to stretch the friendship 😉 Instead, we decided this was a good excuse to take up an offer from one of Mum’s friends to stay with her in Fremantle. So on a few days notice I text Alison to see if we could stay Sunday night (thus allowing us to collect our sleeping bags on Monday before heading to Albany) and lo and behold she said yes! Jason called me two days ago to say the bags had arrived safely and we’re on our way to Freo tomorrow 🙂 So thank you Jason from the West Coast 4WD Centre, Rhys from PMG and Alison! Leaving the Dampier Peninsula and starting to head south was really exciting for me. I had been waiting for this next leg of our trip for ages and I was really looking forward to it. I don’t think Brandon felt the same way – the first half of the trip was certainly what he looked forward to most, whereas the second half was likely to be my favourite bit. We left Broome on the Great Northern Highway and headed south towards 80 Mile Beach (yes, it’s 80 miles long). The landscape was so incredibly flat – I hadn’t seen anything like it before. Brandon said there was a lot of wind around blowing us about the road. It was rather surreal. Nothing but flat landscape for an entire day of driving. Looking north up the beach. Looking south down the beach. We came over a hill and were greeted with water so amazingly blue it was incredible. Unfortunately (for Charlotte) there was no swimming on this beach. Brandon caught a ray – one of hundreds that swam in the shallows of the beach. The volume of shells on this beach is just amazing – it’s a beach that people drive over all the time to get to the fishing spots, but new shells just appear over the top of the crumbled ones. I quite liked 80 Mile Beach. The community of campers was really friendly – we set up right in the middle of the caravans, next to the toilets, and had lots of folks (mostly retirees) saying hi to us. Every day around lunch you’d see all the grey nomads drive their quad bikes (!) down to the beach with their rods ready to go. 80 Mile Beach is where our jockey wheel finally gave up the ghost. It had been playing up ever since Musgrave Roadhouse due to something silly we did and ever since then it buckled and needed to be beaten with a steel mallet every time we wanted to use it. Not surprisingly, it got sick of this mistreatment. 80 Mile Beach was our 26th destination, Musgrave was our 6th so that’s 40 times since then it has been bashed black and blue. Poor thing. Anyway on setting up at 80 Mile Beach it gave up altogether and it’s innards haemorrhaged and it was deemed unfixable. We used bricks and blocks that the maintenance guy found for us to replace the jockey wheel for our 3-night stay. Finding a new one became our next mission. This bus (above) was towing this boat (below) and under the boat was an FJ Cruiser – that’s the way to go!! Unfortunately the end of our visit at 80 Mile Beach was marred by my starting to feel really unwell (as I talk about in another post) and I essentially retreated to the camper for 24 hours with lots of moans and groans. Brandon and Charlotte packed up on their own, bundled me in the car and we made for Port Hedland. After a rather nauseating three hour drive (which says more about my condition and nothing about B’s driving!) we arrived at Amanda and Jamie’s place and were quickly made to feel at home. For the first time in 2 months, Charlotte slept in her own room (which she quickly destroyed)! I could go to the toilet without (a) opening a zipper or (b) walk for 5 minutes, we could lounge around and watch television and, importantly, go to the doctor. Just as important was the fact Jamie was about to start one month on leave and within a few hours of arriving he and Brandon were out on Jamie’s boat fishing. All was once again right in the Hazelwood world. With one of our lovely hosts, Amanda, on our last morning in Port. We’ve known each other since we were 7 years old! 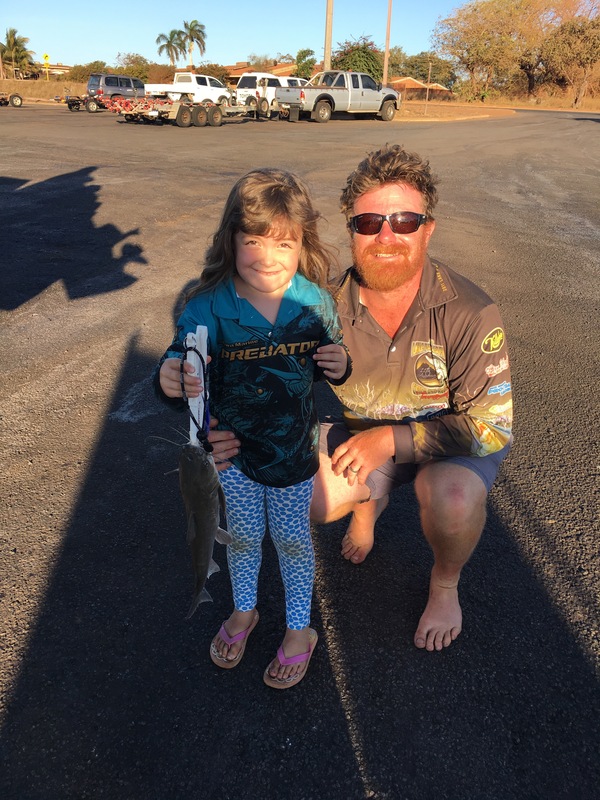 Turns out, we arrived just in time for the 2017 Port Hedland Game Fishing Club Blue Water Classic fishing competition. If we stayed a few extra days, Brandon and Jamie could fish that together. Recalling my early departure from Kooljamin, I was quite happy to give him this fishing time (and give myself more recovery time now that I was feeling better). I feel bad for Amanda who I’m sure had wanted us to do more together but I just needed some r&r and to move slowly. So thank you Harris-Thornton household for helping the Hazelwoods get their groove back. 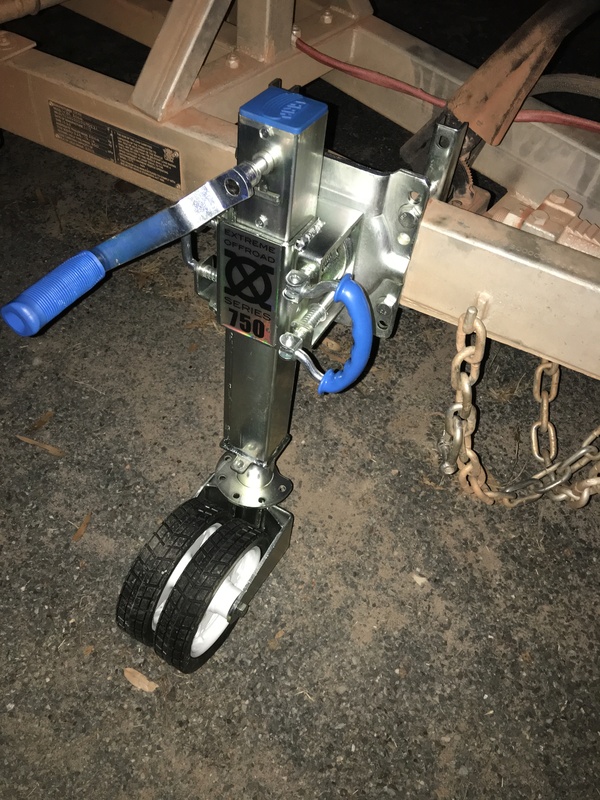 Five days of fishing for Brandon and lots of doing nothing for me (and a new jockey wheel) and we were ready to tackle camper life once again. 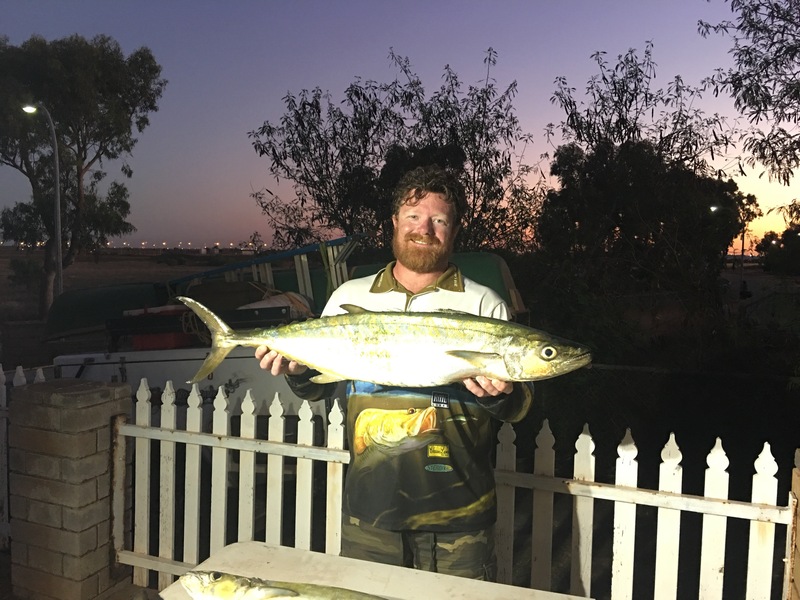 Oh, and we’re pretty sure Jamie caught a prize-winning mackerel on day 1 of the comp but as I write this we are still awaiting official results! Possible prize winning mackerel weighing in at 27.6kg! Brandon is looking more and more like an old sea captain every day! Needs a haircut! Jamie fought a shark for an hour and a half! Weeks/nights on the road at this point: 9 weeks. I quite liked Broome – it had a relaxed feel about it like a small town but still had the comforts of a bigger town like supermarkets and, luckily for Brandon, a physiotherapist (refer to my post about the physical toll our trip is having on us!). I remember when we were planning our rough itinerary that we questioned whether it was worth stopping in Broome because other than Cable Beach and the camel riding at sunset, we weren’t really sure what was here. But I was glad we took the time to rest up here because it really was a very nice little town. We toured the Matso’s brewery (Charlotte listened to the talk but I’m not sure how much she took in! ), and I loved seeing the water and how beautiful it was (although I had no desire to swim in it – swimming at the beach doesn’t really do much for me). There was a water park that Charlotte enjoyed, we went to the markets, and due to the close location of the airport to the town, at one point we were sitting having a drink when a sizable jumbo jet flew straight over the top of us! It was rather odd to see the blue water right next to the red dirt but I’m realising this red dirt is now a fixture in so many places over here. Not long after this, she started quietly using her iPod but full credit to her for attempting to listen as long as she did! Broome is home to the Malcolm Douglas Crocodile Park. This park is only open from 2-5pm each day, and they do an amazing crocodile feeding tour at 3pm. It wasn’t cheap for such a shortened day so I was a bit dubious at first and having only recently been to Australia Zoo with Charlotte, I wasn’t really sure if I would be impressed with this place. But I’m pleased to say that the feeding tour was actually really good and well worth the money! The guides told us all about the history of the park, did some big croc feeding in the central lake and then walked us around to each of the pens and told us about the crocs that were in each pen and how they came to be there. It was very informative and we were quite close to the crocs. Charlotte was fearless – she loved being really close. At one point, we were so close that when the croc lunged up for the food, we were showered with the small green algae that was sitting on top of the water. We also each got to hold a baby croc. I really enjoyed this park and would certainly recommend it to anyone coming to Broome. From Broome we headed north up the Dampier Peninsula. The road was a bit like the PDR. We ended up losing a part of our gas regulator on the Dampier road (but have since replaced it)! In some places the road narrows and there is a flat part and an angled part – like being at a velodrome! I think Brandon took a little too much joy out of driving on the angled velodrome lane and we spent a good deal of time at 45 degrees! (well, as the person on the up side of the car it felt like that but B assures me it wasn’t quite that much). Our first destination was Middle Lagoon which was a lovely little bush camp site near the water. We had been told to camp up on the ridge, but this was a very windy, unsheltered part of the camp site that gave you immediate beach views/access but at a price. Instead we requested another site we’d been told was a little set back from the ridge and more sheltered. It was perfect. We came out of the camper each morning to a beautiful water view, but without the relentless wind to contend with. Charlotte was able to swim at the beach and Brandon did a spot of fishing and shell collecting. It was simplistic and the amenities were old and tired but it felt comfortable and we very much enjoyed our 3 nights at Middle Lagoon. We set up our own ensuite tent and connected to their water which also made the stay that bit more comfortable. From here it was further north up the Dampier to Kooljamin at Cape Leveque. Kooljamin camp ground is dirt (surprise, surprise) and not only that but it’s deep, blink-and-you’ll-break-your-ankle dirt like soft sand at the beach. I usually tend to avoid that sort of sand – it never ends well. With my foot and knee issues, I took my life in my own hands each time I walked from the chair to the stove there was so much loose dirt on the ground. We were squished into a tiny site in the back corner that required an amazing feat of reversing magic from my brilliant husband (whose mad reversing-the-camper-without-seeing-out-the-back-windows skill really does leave me speechless, particularly when there are trees and other obstacles to avoid). And as our camp site was under a tree, we ended up with an ant infestation inside the camper. At one point we went to the reception staff to ask if they could send maintenance over with something to help with the ants and the maintenance guy happened to be there and scoffed at our request because (politely paraphrasing here) he wasn’t going to be able to get rid of the ants that came from nature. I pointed out that we didn’t expect him to get rid of the ants but as they had placed us in a camp site that had overhanging trees that clearly held an active ant nest, they might like to provide us with something that we can spray or place around the camper so that we can try to limit the number of ants that make it into our bed. I was pretty cranky – I had not long earlier woken up to the feel of ants crawling all over my face, in my ears and up and down my arms. They were on my pillow and all over the walls of the camper. I was angry and uncomfortable – someone had to wear my pain with me! 😉 We went for a walk to the café on the other side of the point and when we came back there was a tin of surface spray sitting on our camp table. Small victory I guess. You can just make out the blue tongue lizard who visited camp one day. 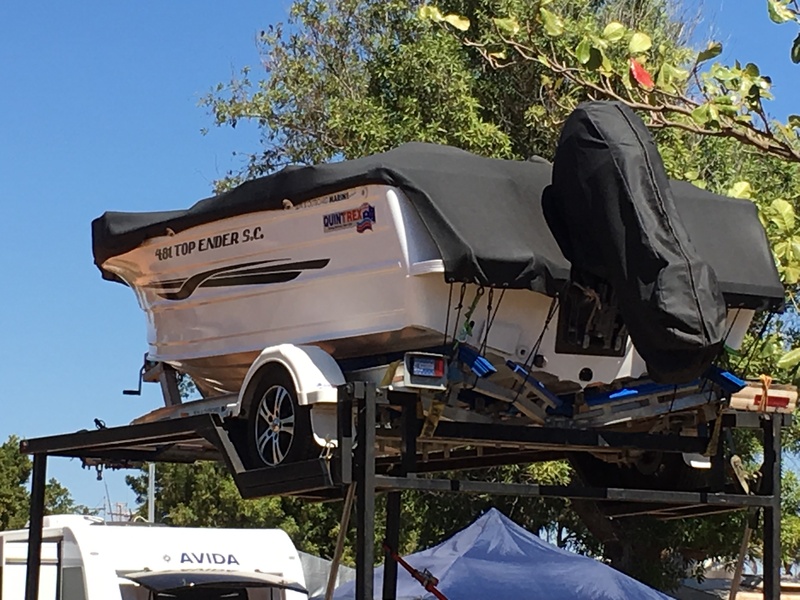 This ‘sea legs’ boat was a ripper – drove straight up from the water to camp and then straight up on the trailer. One thing we did while at Cape Leveque was visit the Cygnet Bay pearl farm. This was a great place! We did a tour of the farm and as we were the only people on the tour, we had the guide to ourselves. She told us all about the pearl industry and how it started in Western Australia. We learned about the difference between farmed pearls and natural pearls, between rock oysters and pearl oysters, and saw the various stages of how they create the pearl in the oyster and how they use the mother of pearl from the shell. We were allowed to open an oyster and retrieve the pearl from within and later we had this pearl graded and valued ($55 – not a great specimen but pretty cool to see). We were also offered the chance to eat the raw pearl meat that came from inside the oyster (not the same as an oyster – more like scallop). I tried a piece but it didn’t do much for me. Crumbed and deep fried may have worked better 😉 We were also allowed to see their most expensive piece of jewelry – a $230,000 necklace. The largest pearl they ever found was also on display – something like 23mm in diameter. There was a restaurant and pool there, both of which we enjoyed, and I quite liked the look of their caravan park. If we ever come back this way, I would definitely be willing to stay at Cygnet Bay. Yay we found a pearl! We learned about the different markings on the pearls and how they classify them – this one we found had circles around it which made it less valuable. I’m not a fan of pearls as such but this necklace was attractive to me because it wasn’t all perfect, round pearls. I prefer these natural ones (called Keshi pearls). This is valued at $230,000. The pool at Cygnet Bay pearl farm. From the first day we arrived at Kooljamin we could see bush fire smoke. I am incredibly nervous about bush fires and to see smoke so close to us got me rather concerned*. No-one else seemed to be concerned but instead of taking that as a good sign, I was convinced that we were all going to burn! We asked at reception and they just said it was a slow moving fire and there was nothing to be concerned about. If you look at a map of Cape Leveque you will see there’s only one road in and out – if fire cuts that road off, we’re doomed. We’d need to launch the canoe and hope for the best! 😉 My nerves were not lessened when I spoke to the man in the camp next door (who owned that sea legs boat) and he told me he was here a few years ago when he was awoken at 4am to the sound of a bell ringing and Kooljamin staff calling out to everyone to pack up and quickly evacuate as there was a bush fire approaching the camp. A quick search on Google and I found a report saying the fire came within metres of the camp buildings. I wasn’t being comforted. And then the next morning I woke up to a weird mix of fog and smoke mingling around the camp site. The staff had never seen anything like it. I looked like fog but was thicker and smelled smokey. That was almost my tipping point. Still the staff seemed unfazed. I came to the conclusion that either we were all completely fine, or we were all going to die. * We later found out that the fire was “15-20km away” and that wasn’t considered close. I’m not convinced. We were supposed to stay at Kooljamin for 5 nights because Brandon felt the fishing might be worth an extended stay based on friends’ reports. But I was so miserable that we left after 3 nights and forfeited our money. We made friends with Glenn and Naomi in the camp site behind us (who Brandon had also seen at Middle Lagoon) and Glenn was a fisherman. They went out a few times together so it wasn’t all a great loss as far as fishing was concerned. Still I knew he wasn’t happy about me being such a wet blanket so I promised myself I’d try to find a way to make it up to him in the coming weeks. 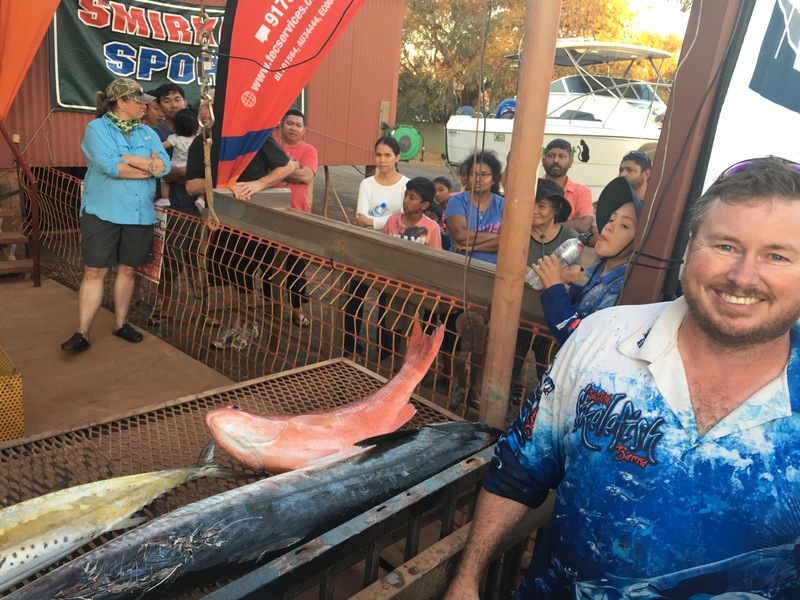 I knew we were headed to Port Hedland where an old primary school friend of mine was living and her partner is a mad keen fisherman – I hoped he’d get more fishing action in Port to make up for missing out at Kooljamin. It’s worth pointing out that Kooljamin have a type of accommodation called a beach shelter that is actually quite nice. You set up your camper next to the shelter and use this large thatched hut as your shelter. It acts as an annex and essentially doubles the space you have available to you. There are fire pits and cold outdoor showers there as well. The shelters overlook the beach and give you immediate access to swimming and fishing etc. The problem is these shelters are $120/night and given that they don’t include ensuite toilets or anything else to warrant this steep price, we elected to camp in the regular camp ground like the other plebs. The next morning we started out south again, heading for 80 Mile Beach and Port Hedland. It wasn’t all plain sailing, however, as our trip to 80 Mile Beach was marred by some health issues, as I wrote about in an earlier post. We have been on the road now for 8 and 1/2 weeks and while there has certainly been quite a lot we have had to get used to over these weeks, one thing I’m really struggling with is the physical toll that living out of a camper is taking on us. I think I’m doing a good job of getting used to the dirt and the constant packing and unpacking of the camper, living out of a suitcase, cooking in gale force winds, having to ‘climb’ out of bed just to go to the toilet, wearing ‘clean’ clothes that really don’t resemble cleanliness no matter how you define it, or having to apply sunscreen just to go and make breakfast. But the passage of time is doing nothing to help me get used to the physical toll that this trip is taking on my old and weary bones. I tell you, there is nothing like living out of a camper trailer to make me feel every one of my forty-five years. I have run half marathons but now, at the end of a long day, I struggle to climb the 3 steps into our camper. Camping is a very physical activity. Every time we stop to set up, we need to lift heavy boxes, clamber through the camper to attach poles, heave this and ho that. There’s lot of bending, stretching, hunching, tugging, pushing, grabbing and just about any other ‘-ing’ activity you can think of that sounds tiring. And on a trip like ours, where you spend on average 3 nights at each place, possibly less, that’s a lot of setting things up and packing things up. At last count, we have stayed at 21 places – that means 42 opens and closes, 42 times we have tugged, pulled, hunched… anyway, you get the point. Just going to the toilet after you are in bed means having to climb over your partner in bed, lower yourself down off the bed, open the zipper to the fly, open the door clasp, climb down the camper stairs (and then remember as you are half way out the camper door that your child-bearing hips and plus size shape mean you are actually too wide for the camper door and scold yourself for not remembering to turn 45 degrees to walk down the stairs at an angle thus saving said plus-size hips from rubbing against the pointy bits of the door as you past), scrounge around in the dark for your headlight then slap the light against your face when you attempt to put the darned thing on, walk to the toilet (which always seems to be at the farthest end of the camp ground when we don’t have our ensuite tent set up*), then repeat everything in reverse to get back to bed. And then you are finally settled back in bed and get that horrid niggly feeling in your bladder that suggests maybe you didn’t get it all out after all so you tell yourself “quick, fall asleep so I don’t feel like I need to go to the toilet again! !” That never gets old. *The indignity of walking through a camp ground with my Choose Life sleep shirt on never gets easier but is certainly better under the cover of darkness. So not surprisingly, after 8 or so weeks, we (OK, mostly me) are/is starting to feel the side-effects, and it’s not pretty. First let’s talk feet. Some of you may or may not know that before we left I was slowly recovering from a wicked case of plantar fasciitis and a heel spur, with a dose of achilles tendinopathy thrown in. After a few months of different treatments and lots of exercise, I was finally starting to feel on top of things. Then I went on an around Australia trip in a camper trailer where the main footwear, if any, is thongs. To quote Vivian (from which movie, movie buffs?) “big mistake, huge”. Throw in a good dose of walking over rocks and dry river beds and spending LOTS of time on my feet and I am in a world of plantar fasciitis hell. I now need to strap my foot almost every day – but in these dirty camping conditions that strapping tape gets seedy pretty quickly. (Note – it also doesn’t help to spill unleaded petrol all over your foot with strapping tape on it – the tape melts and sticks to your foot and thong…) So my foot is suffering. Then there’s the blisters. But not from what you might expect. I have blisters thanks to doing the washing. You may recall I bought a Scrubba bag to do our hand washing while we were on the road. I have tended to use camp ground washing machines where possible (although they are pretty gross and I’m not sure how clean the clothes are getting) but in between camp grounds or if something needs a solid scrub or overnight soaking, I use the Scrubba bag. But that means hand wringing the clothes after they have been washed and then rinsed. And while that might not seem like a big job, you should try hand wringing the equivalent of a full load of washing to a point where they stand a chance of drying in 24 hours. It’s bloody hell on your hands! And, as it turns out, gives you blisters. A small specimen of one of about 6 blisters I had on my hands as a result of washing clothes. Next up? Bugs and insects. While I seem to have suffered only one or two annoying bug bites and Brandon seems to have escaped their clutches altogether, poor Charlotte has had to endure an unending number of bites which she scratches at relentlessly no matter how much we warn her not to. Invariably these end up bleeding and scabbing over, which is further annoyance and pain for her. Charlotte’s skin tends to react quite badly to bites which I suspect is due to some form of eczema so the poor thing is usually left in welts if she’s around bitey bugs for too long. One place we visited she was attacked by midgies that left her feet and legs covered in angry red splotches. By chance a fellow camper recommended a natural product called Midgie Magic that we located in a chemist and it has really helped take the sting out of Charlotte’s bites. Great stuff that! Brandon has also been suffering due to the long hours in a car and the physical work setting up the camper and packing things away again. The downside to having the boat loader on the camper is that all that heavy stuff up there has to come off every time we set up and then go back up there every time we pack up! (except the canoe and ladder – they tend to stay strapped to the boat loader). So it comes as no surprise that Brandon’s back and shoulder are in a world of hurt. He actually went to a physiotherapist when we were in Broome and then at the Broome markets had a massage for half an hour and it seems as though his aches and pains are starting to settle down a bit. The last two injury and illness prizes belong to me. I have a condition in my knees called Chondromalacia Patellae where the cartilage behind my knee cap has slowly worn away. It makes for very painful kneeling and bending but for the most part, I’ve learned to live with it. In one knee however a side-effect of this disease is the ligaments that run behind my knee and hold my knee cap in place are also very worn and tired (I know how they feel!) and, if I squat down at the same time as turning my knee slightly, I can actually twist the ligaments around themselves and slightly pop my knee cap over to one side. A semi-dislocation, as it were. As you can imagine, this is rather painful so over the years I have learned to avoid putting myself in positions where this problem can occur. I probably got a little complacent on this trip because I was more concerned about my foot than my knee, and I haven’t actually had many problems with my knees since I’ve taken up running. But unfortunately that all changed in Broome as we were packing up and getting ready to hit the Dampier Peninsula. I squatted down to attach the camper’s Andersen plug into the back of the car and I felt that familiar pain in the back of my knee. It was too late to correct my stance and before I knew it I was on the ground moaning in pain and swearing at all manner of spiritual beings. I ‘popped’ it back in place fairly easily – lucky. It doesn’t always go back as easily and once I remember writhing on the floor in pain in my bedroom and calling to my father in law who was 20 metres away at the other end of our house to get him to come up and pop my knee back in for me. Not pleasant. Anyway, this wasn’t quite that bad but it certainly wasn’t pretty and the end result was that I really couldn’t walk 😦 So I was bundled into the car while Brandon finished connecting things up and we started our trip to the Dampier with me feeling rather sorry for myself. We couldn’t walk the many gorges of the Gibb because of my foot and now who knew what we wouldn’t be able to do because of my knee. Upon arriving at our first destination on the peninsula I felt a little better and was able to walk. I went back through the memory banks for how my orthopedic specialist used to strap my knee in times like this and ended up strapping the knee so that I could at least help set up a little more. I couldn’t bend my knee though so I was still limited but at least I was pain free and mobile. The last incident is less of an incident and more of a growing discomfort. For a few months now I have felt a niggly pain deep in my lower right abdomen. It hasn’t really bothered me before now, it comes and goes, but I should have expected that even the mildest of discomfort is likely to be amplified while living in a camper trailer for three and a half months. So it shouldn’t have surprised me when my pain became worse while we were staying at 80 Mile Beach on the northern coast of WA and out in the middle of nowhere. I was in a world of hurt, nauseous, clammy, unable to eat or concentrate on anything except my own discomfort. It wasn’t gastro (being the parent to a 6 year old I’m intimately familiar with those symptoms!) but I had no idea what it was. And in true hypochondriac fashion, being stuck in the middle of nowhere, I was convinced that there was something really horribly wrong with me and I was about to die. So then my anxieties took over and amplified all of my pain and symptoms to the point where I really couldn’t do anything except groan, cry and lay around the camper feeling sorry for myself. We were due to arrive in Port Hedland the next day so we made a doctor’s appointment for me and I just toughed it out until then. To be fair, Brandon had to be more tough than me – he had to look after Charlotte all by himself while I was useless in the camper knocked out on codeine, he also had to pack up the camper and our gear all by himself when we left the next day with me groaning and feeling exceptionally sick in the front seat of the car all the way to Port. Thank god we were staying with friends in Port so that I actually had a bed and a lounge and carpet under my feet and some sense of normality about me. I could have a nice hot shower (without wearing thongs!) and relax a little bit. If it weren’t for that, the next 24 hours after that point would have been hell – again, more for Brandon probably than me! The doctor sent me off for scans at the local hospital, Hedland Health Campus. 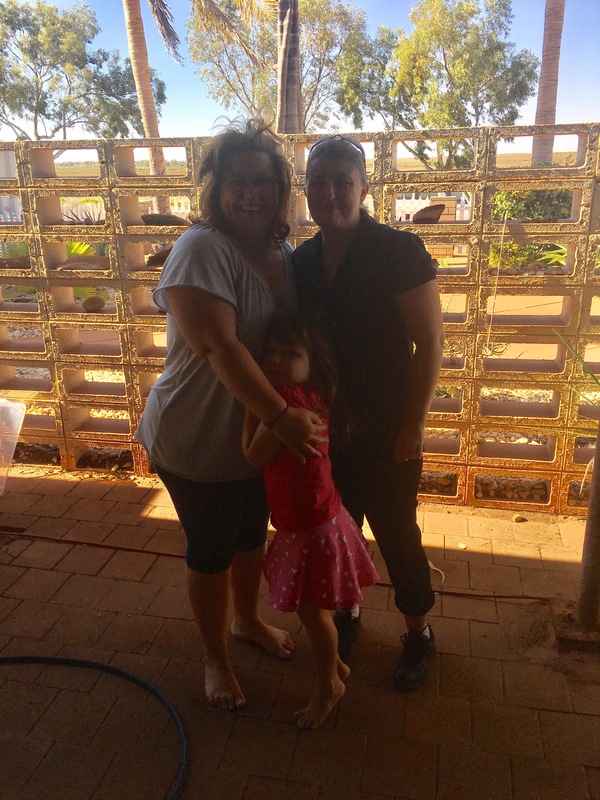 Hedland Health Campus – never have I been so happy to see a medical building! This is just a small place and is the only place you can get imaging done in town, and I was told that people typically wait 3 weeks for an appointment. As my doctor didn’t think I had appendicitis, I wasn’t considered critical enough to get an emergency appointment (travelling isn’t considered enough of a reason to get ahead of people, and that’s fair enough I guess). But I rang and harassed them and said I was in huge amounts of pain (and threw in some genuine tears) and thankfully I was given an appointment at 10am the next day. I was honest with my doctor and admitted that my pain was probably more psychological because I had felt so isolated and unable to soothe myself with the comforts of home, thus making my physical pain a lot greater and more significant in my mind. I knew as soon as I had that scan I’d start to feel better, regardless of what they found. And thankfully they found nothing. The diagnosis now is a combination of things – ovulation pain (gotta love being a woman), combined with the possibility of pulling or straining myself a little too much over the weeks, potentially aggravating an injury that might have happened before we left. The nausea was probably because of (a) my anxiety and (b) taking codeine on an empty stomach. All of which was amplified in my mind into something far more serious thanks to isolation and lack of creature comforts. Boy, am I glad those 72 hours are over! I’m off the pain meds now and the pain is receding as I’ve spent the last two days laying around on a proper couch in a proper lounge room, relaxing and catching up with friends which has clearly had medicinal powers. So prepare yourself physically if you decide to undertake a trip like this. Definitely buy some Midgie Magic, bring lots of strapping tape, and make sure you have all niggly pains etc checked out before you leave. Murphy’s Law says you will feel that pain again when stuck in the middle of nowhere and it’s really quite amazing what our brain can do to amplify our discomfort and convince us that there is something truly horrific happening to us when really we’ve probably just pulled a muscle. So when I last wrote, we were leaving the Bungle Bungles headed for El Questro (ELQ) and the infamous Gibb River Road. We decided to stay at a 24 hour rest stop on the way to ELQ so as to be there nice and early the next day (to get a better camping spot – see, we’re learning the way of the “we-don’t-take-bookings” camping world). It was our first rest stop camping experience and it was actually quite pleasant. We got there around 2.30pm so we were able to pick a good spot with a shelter and table which reduced the amount of stuff we had to unpack for the night. It was with some degree of excitement that we approached the sign to mark the start of the Gibb River Road, and then the turn off for ELQ. We had seen both of these things so often on the DVDs and television shows we’d watched to help plan this trip that it was great to finally be seeing them I the flesh. The drive in to ELQ was corrugated dirt roads (groan) but we let the tyres down (again) and made our way without drama. There were a few water crossings but nothing too substantial and eventually we got to ELQ nice and early. Our plan worked and we secured a lovely shady camping spot down near the Pentecost River. You were allowed to source firewood from anything that was laying on the ground around the property so Charlotte and Brandon went off in search of something for our fire that night (not that we really need it – it only gets to about 15 at night around here!). I couldn’t stop laughing when Brandon came back dragging what looked to be a giant tree trunk. Turned out the joke was on us – for whatever reason, this log left a bitter burning smell through everything. Its ash was very light and flighty and it covered our camp with ash and filled our camper with this disgusting stale-ashtray smell. We don’t really know exactly what sort of timber it was (it was a little porous inside but we don’t know if it was a boab branch or not…) but whatever it was, I’d recommend you never burn it near your campsite!! There is one sort of tree around here that is apparently nicknamed the shitwood tree because when it’s burned, it smells like dog poop. This wasn’t quite like that, but it was equally as noxious. We stayed at ELQ for 4 nights and had a lovely time exploring their surrounds. El Questro is essentially a large working cattle station but they have turned themselves into a major tourist attraction in the dry season. There is a fancy homestead you can stay in if you have muchos $$ or else you can slum it like the rest of us in your own camping set up or in the onsite tents. There are lots of gorges on the property that you can walk to (after a short drive), there’s a bar and restaurant, horse riding, helicopter sight-seeing flights (also muchos $$) and cruises. Every night we’d wander up to the bar for happy hour from 5pm and listen to the musician playing that night and relax under the stars. It was here that we discovered Matso’s Ginger Beer. I’ve never really been a big ginger beer fan except for in punch but I decided to give it a go on a whim and I was so pleased I did! It was so refreshing and tasty. And then I discovered that Matso’s brewery is in Broome! Hold me back! A quick google search told me they did brewery tours on Wednesdays and Fridays so we knew we had to stay in Broome long enough to cover at least one of those days! On our final night at ELQ they put on pizzas – they must have known I was experiencing withdrawal after my less than tantalising pizza experience in Kununurra. There are only a few places I’d be willing to be seen in public in ugg boots – clearly ELQ is one of them! We did the walk to El Questro gorge and it was magnificent. Charlotte had a swim in crystal clear water that looked incredible. The fish even came up to her to say hello! Unfortunately, the walk involved scrambling over quite a number of rocks and boulders and was quite hard on my foot. It really tested me and I was barely able to walk by the time we got back. The walk was about 1.3km in each direction and just about all of that involved putting your feet on rocks or boulders and not on an even surface. I was in a world of hurt 😦 I strapped up after we got back to camp but it really made us have to think twice about our future walk plans. Brandon’s shoulder and back were also playing up thanks to long hours in the car and then heavy work setting up the camper each time we stopped (refer above comment about needing a caravan!!!). To top it off, we seemed to be having some small problems with the batteries in our car not holding charge as well as we’d like and the engine running a little hotter than we’d like. No one single issue was a big deal on its own, but put together, they all made us question the sensibility of taking off to tackle 600km of corrugated road in the middle of nowhere with the car not running smoothly and bodily aches and pains that were leaving us feeling less than enthusiastic about the walking and adventures to come. We discussed the situation and ummed and ahhed and came up with the decision that we’d not do the Gibb River Road in its entirety. We would double back to the Great Northern Highway, south down past the Bungle Bungles, through Halls Creek (where we got some supplies) and start to head north to Fitzroy Crossing and then turn off at Windjana Gorge/Tunnel Creek, heading north west from there. We’d visit Tunnel Creek as a day trip and set up camp somewhere on the other side. The (dirt) road in to Windjana continues and meets up with the Gibb at its northern end so we’d still see the end of the Gibb but be closer to civilisation should anything happen. As we weren’t feeling up to doing much walking, it seemed silly to just drive the Gibb, possibly at risk of damage to the car, just for bragging rights. From there it was on to Tunnel Creek. On the road in we saw a few different long-dead cars left on the side of the road. Hadn’t really seen that since we were on the Cape so it was a bit of a surprise. Even more surprising was seeing that one of the dead cars was an 80 series Landcruiser! Gosh – what a remarkable place Tunnel Creek is! During the wet season it would be almost completely under water but during the dry season you can walk through the entire cave (with headlamps). There are parts where there is some deeper water you need to wade through, and we had some reptilian company during the walk in places, but it was well worth the effort. It was largely sand we walked on so not as difficult as our past walks. And being underground it was extremely cool and walking through the water made it quite refreshing. On the recommendation of some of the others we talked to, Brandon and Charlotte walked a little further at the end of the cave to see some Aboriginal art on the rocks further up. It was probably a little less grand in scale than Brandon had been expecting, but it was impressive all the same. After here it was an easy drive to Derby where we got fuel but we didn’t have a good feel about the place so we kept going and ended up setting up for the night at a roadhouse further down the road. It was all you could eat BBQ night and they had cold beer – sounded OK to us! That stop marked 3 overnighters in a row for us and (a) no set up arguments and (b) it was done in the dark. We’re clearly getting used to this! Weeks/nights on the road: 5 weeks, 6 nights.